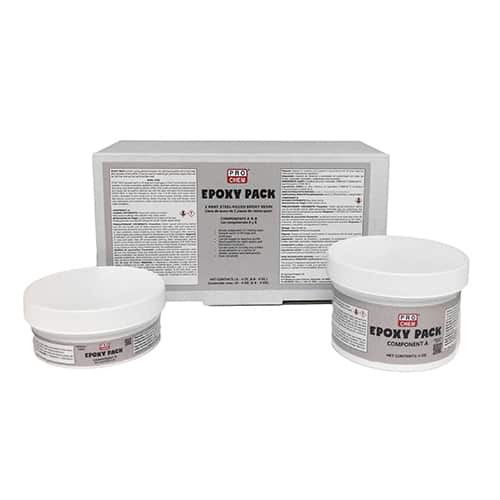 Epoxy Pack | Pro Chem, Inc.
EPOXY PACK is a two-part, general-purpose, fast-curing epoxy resin with a high steel-alloy content (40%). It is used to make tough, permanent repairs that are rust free and can be machined like steel. When fully cured, conventional metalworking techniques can be used to machine, tap, drill, file, sand and paint the finished repair. This product quickly and easily repairs holes and cracks to virtually any surface. Surface Preparation: All surfaces should be clean, dry and free from all contamination, particularly oils and greases, which would impair bond and could lead to premature failure. Ideally surfaces should be abraded with a fine emery cloth, followed by a solvent wipe with dry acetone or commercially available degreaser. Apply mixed product immediately after cleaning to avoid possible post-cleaning contamination. Mixing and Application: EPOXY PACK hardener component will skin in contact with air. Any product skin should be removed and discarded before use. Mix each side before using. Wear impermeable gloves when mixing or handling uncured product. Measure out equal volumes or weights of the two components, using different utensils for each to avoid contamination. Use only the amount needed for the job at hand. Mix together with a spatula for a minimum of 1 minute until uniform in color. Use a spatula to apply to clean, dry surface and remove excess material before the paste begins to set. It is recommended that repairs be completed within 1 to 2 minutes to avoid disturbing the repair as it begins to set. To achieve a glossy finish, smooth the surface immediately after application with a knife moistened with a solvent such as acetone or mineral spirits. EPOXY PACK will start to set within 5 minutes at 68°F (20°C), depending on volume or temperature: the greater the volume (or higher the temperature), the faster it will set. Allow 1 hour before handling, and 24 hours before returning to service. After 24 hours the application can be drilled, tapped, filed or sanded to shape and painted. For advice on building multiple layers, please contact the Pro Chem, Inc. technical services department. Shelf Life: One year from date of shipment when stored in dry storage area in original, unopened container at 68°F (20°C). To avoid contamination, do not return unused product to containers.